The Battlestar Galactica, humanity's last beacon of hope, falters and crumbles. A tenuous solidarity between human and Cylon wavers under overwhelming desperation and doubt. For those seeking the promise of peace, a single vessel guards the future. The Demetrius, guided by unknown forces, plots a course through the stars – a course for home. Many would oppose this vision of the future. In this desperate time, both human and Cylon are driven to take matters into their own hands. For some, this means risking everything. For others, this means mutiny. 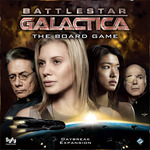 Battlestar Galactica: Daybreak Expansion brings humanity's plight to its gripping climax. With two supplemental game boards, twelve new character sheets, thirty new Crisis cards, twenty-five new Skill cards, and much more, Daybreak invites players to undertake desperate missions, struggle under the constant threat of mutiny (through the addition of a Mutineer card in the Loyalty deck that can affect either human or Cylon), and bargain with Cylon Leaders driven by motives of their own! Daybreak also includes rules and components for an optional Battlestar Galactica experience titled "The Search for Home", featuring a new endgame and a new game board for the Demetrius, the sewage processing ship that becomes the fleet's best hope of salvation.